Many people ask me why I started my company. There are a bunch or reasons why, but one of the main reasons was because I wanted to 'revive' people's skin from the products people are used to using on their skin. Using a bar of commercially made soap (even Dove!) is like washing your skin with dish washing detergent. One of the main reasons why people have skin problems is because they are not nourishing their skin with the things it needs. Your skin is the largest organ in your body, and it is the thing that protects us from diseases and harmful substances. Why would we not take care of our skin like we take care of the inside of our bodies? If you are allergic to a certain type of food, do you continue to eat it? So why do we continue to use skin care products that dry out, irritate, and harm our skin? 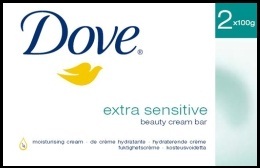 Now I've heard a lot of people that say they can't use commercially made soap can use Dove soap on their skin. It's all about the 3/4 moisturizers in the soap right?! Wrong!! Those are NOT good moisturizers, but rather fake chemicals that force themselves into your skin and supposedly "moisturize". Ruth from WhatAllergy.com writes an awesome post about how even products labeled 'for sensitive skin' can be misleading, and many times these products are filled with detergents and skin irritants. I’ve chosen one product which claims to be good for sensitive skin but sends my skin into melt down. I’m sure lots of people with sensitive skin can use this product without any problems but I wondered what would possibly be causing this reaction so let’s have a look at the ingredients in Dove soap. Sounds lovely doesn’t it. I’m sure many, like me, dashed out to buy this to try it. My relatives acquire many products in this way as one use is enough for the ‘sensitive skin barometer’ to make its judgement. This soap had me itching in the shower just using it once and left me with mild eczema on my arms and legs. I thought I would investigate to try to pinpoint which ingredient it might have been that caused me a problem. A rather pathetic 2 ingredients are mild and gentle on your skin." She goes on to say..."Now just because something cleans a mirror so it’s completely smear free does not mean it’s going to make a good skincare product for people with sensitive skin. What on earth is that advert all about? I suppose it’s saying there is no residue left on your skin after use, but if you rinse your skin properly there shouldn't be anyway should there? Perhaps I’ll use Dove soap next time I clean the windows! Can you use Dove soap? Why would a skincare manufacturer make a soap for sensitive skin with over half its ingredients being potential known irritants or allergens? I would surmise that it’s probably cheaper to use the ingredients above because they’re not chosen for their benefits to sensitive skin. Watch what you put on your skin. Your skin could absorb as much as 60% of what you put on it so be kind to it." People, we really need to start thinking about the things we are putting on our skin! And the good news is, our Tackle soap is currently 50% off! So get this natural soap bar that is GOOD for your skin before we run out! Have a great Tuesday, and remember to think twice before you buy a bar of commercially made soap! Dove is primarily made from synthetic surfactants, soaps (derived from vegetable oils such as palm kernel) and salts of animal fats (tallow). Nice Blogpost,Thanks for sharing such useful information in your website. If you are searching out for the best treatment for the Morgellons, Collembola skin infection, Nature's Gift™ Debriding Soap provides an instant relief form Morgellons, Collembola, Skin Fungus, itchy skin, parasites skin or other Skin Infections.For more information contact us at Morgellons home treatment. Are you suffering from itchy skin, parasites skin, Collembola, Morgellons, Skin Fungus or other Skin Disease? Try Debriding Soap cure which is made from natural substances you should visit at debriding soap.